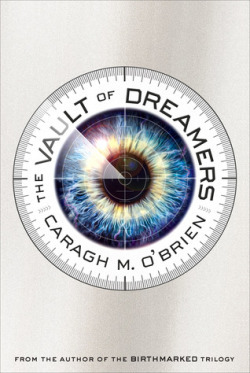 Welcome to the Working for the Mandroid stop on Caragh M. O'Brien's tour for her upcoming YA science fiction novel The Vault of Dreamers. This is a captivating story that takes place in a not-so-conventional boarding school where things are nothing like they seem. I'm happy to say that O'Brien and Roaring Brook Press have provided a copy of The Vault of Dreamers for one lucky Working for the Mandroid reader. You can find the entry form after my review. I received an ARC of this book from the publisher. I have always been fascinated by boarding school stories, probably because as a child I had some romantic notion that attending boarding school would have been exponentially more interesting than normal public school. Alas, I wasn’t able to ship myself off to another part of the country to attend school, so even now as an adult, I find myself living vicariously through boarding school books. The Vault of Dreamers is probably the oddest yet fascinating boarding school book I’ve ever had the opportunity to read. At some point in the future, a prestigious art school in the Midwest decides to maintain a live feed of all their students, creating what would become an incredibly popular reality show. Rosie, our main character, has the great fortune of being one of the handful of new students to join the school and its reality show. She comes from a poor family that lives in a boxcar, but she’s always dreamed of making films. The Forge School is a dream come true, though they make her and her classmates take a medication to sleep for 12 straight hours each night, claiming it enhances their creativity. So right away this school is a little sketchy. I mean, they knock the students out 12 hours a day after filming them 12 hours a day. That is not normal boarding school activities. When Rosie skips her nightly pill and sneaks out of bed, she discovers that some other sketchy nonsense is happening at night when she watches the school doctor infuse a classmate with something that gives her seizures. The rest of the book becomes a cat and mouse game as Rosie attempts to unravel the mysteries of the Forge School while avoiding the very sketchy dean and his staff. Rosie is a somewhat generic YA heroine, determined and a little self-righteous though also full of self-doubt. She’s found herself in an unknown place without an ally and not knowing who to trust. She meets a kitchen boy named Linus, who might help her unravel the weirdness that seems to chase her. Linus is a mild boy bad, introduced by getting punched in the face by the school chef for little to no reason. Small elements are tossed into his back story, but he remains a pretty hazy character. As Rosie doubts his motivations for staying close to her, so did I. Linus doesn’t seem to have much motivation and at times is just a convenience mouth for exposition. It’s not often that a book leaves me inspired so that I want to write the continuation myself, but The Vault of Dreamers did. The plot is familiar, yet innovative and full of unexpected surprises. Any flaws that might have come up with lack of full characterization were quickly forgotten by the time the crazy hit the fan. The Forge School is not a boarding school I would ever hope to attend, but I can’t wait to return to Rosie and the Forge School to see where O’Brien takes her. So does The Vault of Dreamers sound like a book for you? Enter to win a copy from the author. The contest is open until midnight on Friday, September 26, and is open to anyone with a mailing address in the US. Good luck! Caragh M. O’Brien is the author of the BIRTHMARKED trilogy and THE VAULT OF DREAMERS, both from Macmillan/Roaring Brook Press. Born in St. Paul, Minnesota, Ms. O’Brien was educated at Williams College and earned her MA from Johns Hopkins University. She recently resigned from teaching high school English in order to write young adult novels. You can visit Caragh at her website here. She will also be taking part in the Fierce Reads book tour this fall. Here's the schedule, so you can see if she'll be stopping by a book store near you.